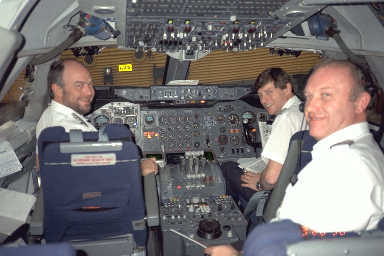 I had the wonderful opportunity to visit the flight deck of a British Airways 747-100 when I flew to London in March, 1996. I was able to take some photos as we were on approach to Heathrow, as well as some of the aircraft we taxied past on the way to the gate (including a British Asia Airways 747-400). There's no way I could manage the lists hosted at smoe.org without Majordomo. There are a number of patches available that extend it's functionality. Follow this link for an Autogallery collection of pictures. You can follow this link for another way to view my Autogallery collection of pictures. Follow this link for a collection of hacks I make available in case they help anyone. I'm currently working at Zeta Global (formerly e-Dialog/eBay Enterprise Marketing Solutions). My resume is available here in PDF format. I was involved with the founding of the North Atlantic Audi Chapter and I instruct with many other clubs. I time trial with COM Sports Car Club and currently sit on the COM Board of Directors. My professional blog may be found at The Datacenter Wrangler. I perform with the The Boston Byzantine Choir.